Listen to the whisper of the winter as it quietly enters your life today. The silent tip toe of the snow upon your nose or outside your window can easily awaken your heart to a deep felt sense of peace. There is so much gift in nature. Nature blesses us with itself, so that we are able to awaken our spirits through the gifts of our senses and our awareness. And as we awaken deep within our soul we experience blessing. May you too see the gift in your life, as this winter comes upon you. And as each day gets longer and brighter, may you feel more light in your life. May you celebrate your own light, and share love with others. May you recognize, deep within your soul, the absolute amazing blessing you are, and the amazing blessing of your life. 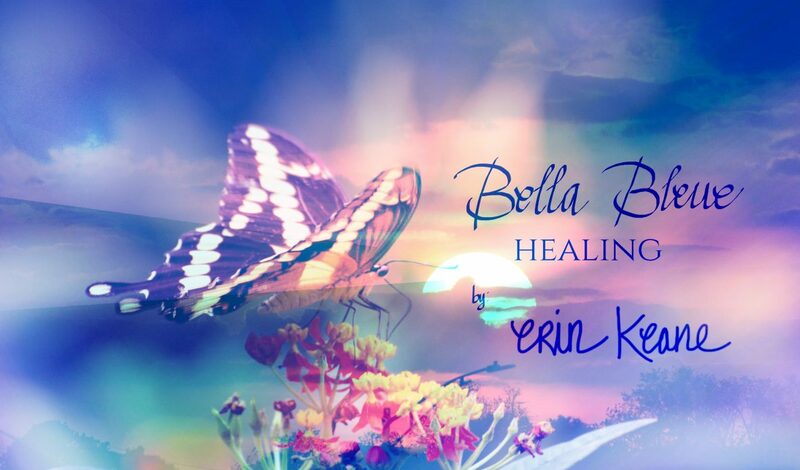 Like my Facebook page Bella Bleue Healing for more inspiration or follow my Instagram Page ErinKeane_Design for more of my art & photography. and been replaced by Faith. Although last week left me feeling full of uncertainty, I have come to a place within myself that I call Comfort. I still do not have my answers, but I have prayed, and asked. I have searched, and been loved. And now deep within I know it is my Faith, that has given me the courage to keep moving forward. 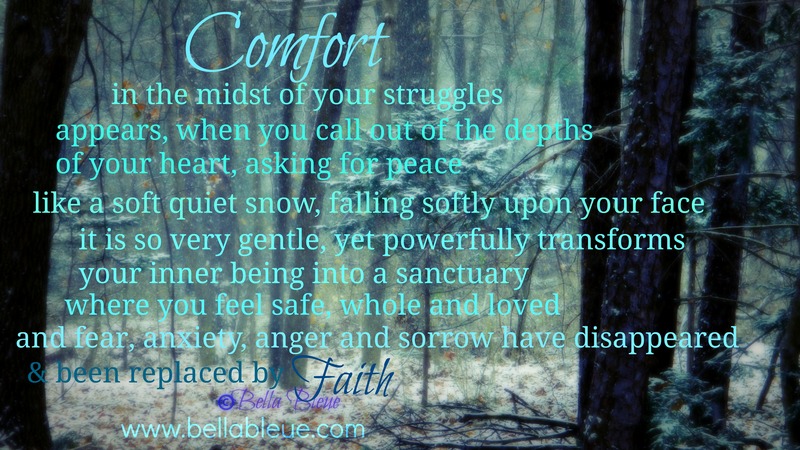 It is my Faith that has allowed, me to feel comfort, a wholeness, where once only anxiety and fear lived. May you also be blessed with Comfort in all those places in your life, where you need to feel whole and at peace again. So you don’t know where life is taking you? Maybe you thought you were on one path and suddenly there is a detour, and you are forced onto a road you would never have chosen on your own. And as you are going down this path you keep looking for road marks that you recognize, and sometimes you find one, but when you get up close you realize it is not the marker you know. In other words, life is filling you up with uncertainty, and you are doing all you can to regain the certainty in your life. So I’ve been working at calming myself daily, to regain my center, to just feel like me again. And daily I seem to be discovering something that does allow my mind, body and spirit to regain some balance, even if I fall off track again. For the first few days, I did my research. I educated myself. Sometimes this puts my mind at ease, other times it just creates more worry. But I like making sense of things so it mainly helps. I looked for stories about other people who went through what I am going through to both normalize my situation, but to also find comfort in knowing that I’m not the only one who has the questions I do. There is something very comforting in knowing I am not alone in my journey. I have reached out to those who I love, and who love me, and just asked them to listen. And to pray for me. I find that there is great power in communal prayer or intentions of healing towards those we hold in our hearts. So I always ask for prayers when I need them. I have opened myself more to the Spirit, and offered prayers for myself, asking to have my mind and body calmed; for acceptance no matter what the outcome is; and for blessing upon me. I have begun to pause throughout my day and be thankful for what I already have in my life, and to celebrate these gifts more intentionally throughout my day. Gratitude heals worry. Every time, I remember to I try to breathe in, hope, peace, and love, and to breathe out all that burdens me. 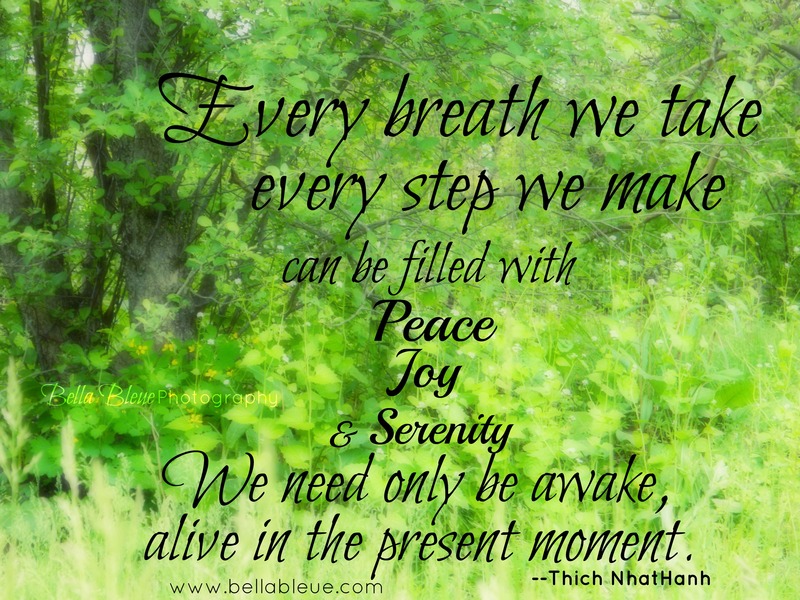 Giving intentionality to my breath helps my body relax. I am attempting to exercise, to get the powerful positive endorphins moving though my body, so my cells can be filled with healing. This creates a better balance between my mind and body. I’ve been using the gift of remembering to put my heart at ease. I look back at times when I was filled with uncertainty that I somehow made it through. This is a source of inner strength that I can turn to over and over: I’ve gotten through difficult uncertainty before so I can do it again. And I have been remembering that even though when I am uncertain, and I want answers right away, that getting them right away isn’t always that easy. But that the answers will come when they are supposed to, and whatever they are, I will be okay. And I am working at being in the present moment, instead of always looking at the future. How about you? What do you do with uncertainty that helps you feel better? I’m always looking for ways to help put balance back into my life. It certainly is a daily chore. Are you the person you imagined yourself to be? Instead take a look again. notice every part of you. that may feel connected beyond this world. Let Go of all the false images about you. Wash your face with water and tender hands. Look up again into the mirror. You are a living miracle. And walk out the door with your head held high!